ClearCase isn’t my favourite source control system. I find the UI clunky and for the most part, it’s way over engineered. Trigger “NO_RMNAME” has refused to let rmname proceed. WHAT DOES THIS MEAN AND HOW DO I DELETE A FILE?! Cassini is the Visual Studio development web server. Generally, Cassini is great; you give it a port number and a path and off it goes – hosting ASP.NET pages in a similar fashion to ISS but much quicker. Plus, it’s unloaded when you stop debugging. One issue I came across today was with Cassini and the loading of assemblies. During development of .NET applications, I like to use project references rather than binary references (whether those references are in our out of the GAC). … and setting the DEVPATH environment variable to the directory where your private copies of assemblies are located. This is supposed to load a matching assembly regardless of version. Unfortunately, this didn’t work and for whatever reason, a ComException was being thrown very early on when Cassini started. This worked great and saved me having to use IIS or copying my assemblies all over the place so Cassini can load them. I hope this post proves useful to anyone having a similar problem. It will probably prove useful to me when I come across the problem again in the far future having forgotten how I got around it the first time! Scott Hanselman blogged recently on reasons to make a class public in a framework. One reason was that a developer may want the functionality offered by a particular class, either to be used as-is or to be extended. Normally, frameworks are quite specific in what they do and what they provide. If a whole ‘chunk’ (class) is required to be made public, then it may be the case that this functionality isn’t in the realm of what the Framework was designed to offer. For example, should a class that lists the zipped files in a directory be exposed from a compression framework? Or, should a regular expression helper class be exposed from a logging/tracing framework? Opening up large chunks of code because someone wants the functionality can dilute the Framework and make the API harder to understand because it offers so much functionality. With this in mind, if the framework you’ve given them doesn’t do what they want, then maybe rethink ways of incorporating the functionality into the Framework rather than opening up a chunk of code. You might be thinking that it’d be difficult incorporating all the functionality of a particular class into other parts of the framework; classes, whether internal or exposed, should be succint (following the Single Responsibility Principle) – so there shouldn’t be too much to move around to give them the features they require. When we start talking about frameworks and OO concepts such as SRP, it brings to mind a very valid point raised in the excellent Framework Design Guidelines book – something along the lines that OO should play a part in the implementation of a framework but not in the API of the framework (I think the example of Streams/TextReaders was used as a very good example). The .NET Framework now seems to have more and more utility classes that help to flatten the heirarchy and (in my opinion) increase usability/memorability. Some examples would be a good way of testing our arguments. Perhaps examples based on the .NET Framework wouldn’t be the best to use as this is a lot more generic than say, frameworks for logging/tracing or compression. Today I needed to get the Windows XP Product Key but didn’t have the neccessary information to hand. I did a search and found the MagicJellyBean utility. This worked but I was curious how it worked. I read around a little bit and discovered a snippet of C# code from Willem’s blog. I then modified it a bit and created my own C# WinForm application. 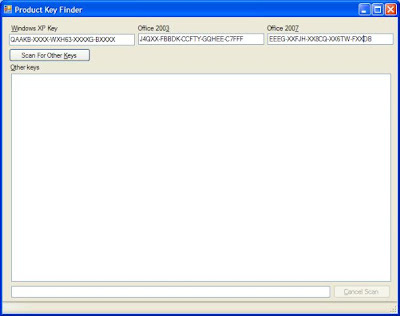 The application lists the most common product keys (Windows XP and Office) and has a button to search for more keys that look like product ID’s. It searches all keys in HKEY_LOCAL_MACHINE. Here’s the source code and here’s the binary. Note, the application depends on the .NET Framework 2.0. Also, save the binary before running it otherwise it’ll run with restricted permissions and won’t be able to probe the registry. The name is a bit of a mouthful, but sums up what it’s all about. It finds orphaned items in a Visual Studio project. Inspired by Clean Source Plus, this utility is a stand-alone application and also a right-click Explorer menu item. Recently I came across several dozen projects that had been worked on by dozens of people for several years. Inevitably, there were files present in the source tree that were not part of the project. This is a tool to find those files. Please feel free to download it from CodePlex. There is an installer file and the source code is also available. If you’d like to contribute to the project, please let me know. To use it is very simple. Download it and run it, or right click a Visual Studio project in Explorer and ‘Find Orphaned Items…’. I’ve tested this project on Visual Studio 2003 and 2005 projects. I haven’t tested this on Web Projects or Web Application Projects (in Visual Studio 2005). I would recommend verifying what the application thinks are orhpaned items. If it continually gets it right, you can trust it more and check it less. If it continually gets it wrong, then please let me know! It’s sometimes the strangest (and seemingly irrelevant) combinations of technology that give you the most problems. For a good few hours I’ve been wondering why my web site, which uses Forms Authentication and Themes, was not displaying any formatting or images. The tricky part in finding this was that the page’s HTML looked fine, there were no errors, and saving the resulting HTML to a file and viewing it produced the right results. Once I saw this, it all fell into place! BackgroundWorker objects are an addition to .NET 2.0 to simplify asynchronous programming and are very useful in (but not restricted to) Windows Forms. …then, in your form you get notified of progress and can cancel the operation at any time. I’ve created a ReSharper Live Template that will help you create and set-up the BackgroundWorker object. You can download it here. For instructions on importing the Live Template into ReSharper, see my previous post here. ReSharper Live Templates for validating parameters of public C# methods. I’ve created 3 Live Templates for validating arguments in public methods (C#). Here’s a short video demonstration. I’ve blogged about these before for ReSharper 1.5 and said that there’s no way to export/import the templates. But in ReSharper 2.0, there is! You can get them here. Go to ReSharper/Options/Templates/LiveTemplates and click the ‘Import templates from file’ button. Author stevedunnPosted on 4th October 2006 Categories UncategorisedLeave a comment on ReSharper Live Templates for validating parameters of public C# methods.